I am about to buy some mould-making equipment to start actually making moulds of my character's head for silicone. Before I do, I want to know what would be the best product, and method for making a mould of characters with rather large noses. I was going to try Pinky-sil because there's a hard 3D printed skeleton underneath the sculpts which might not come out if I used a moulding material that hardens to much. But we'll see what you all think. I'm not any kind of expert on moldmaking - and in fact when it comes to making copies of faces I've done them as sculptures rather than in rubber (my puppets have always had hard heads in the Eastern European puppetfilm tradition). And I've always designed my heads so the molds could be really simple, just a one-piece pour that I then slit in a zig-zag down the back. But I can offer at least some advice to get this thing rolling. First - wow!! Those are gorgeous sculpts!! So much character, and they look alive even just in still images! As for making molds - it looks like you're either going to have to make complicated multi-part molds or cut the heads into pieces and cast them separately. They go way beyond just having undercuts. For the top one I would cut off the eyebrows and cast them separately, then attach them after casting. The nose looks like it would be a formidable problem, and I haven't tried to cast anything comparable, but I suspect even if you remove the eyebrows you'd still need to make a multi-part mold - the nose looks like it needs a seam right down the middle or to also be removed and cast separately, and I don't know how you could re-attach it seamlessly later. For the second one I would remove the mustache parts and cast those separately. You might be able to get away with the rest as one piece. I would definitely use silicone for the molds. Did you use a sulphur-free clay to model these? If not then you'll need to use tin cure silicone for both molds and final castings - platinum cure is infamously finnicky and won't set up if there's even a whiff or an echo of sulphur or latex anywhere nearby. Personally I think I would remove both noses and sculpt some more onto the root parts of them so they can extend a little ways into the heads, and work out some way to make sure they interlock snugly so even though they're separate they don't look like it. That way you've got the wrinkles running around the base of the nose area. This would work I think, though you might have to exaggerate the wrinkles a little bit. Of course, if you were going to do that it would require re-planning the armature and how they're going to be physically attached etc. But I've only had a little experience in casting silicone, it was years ago, and I haven't thought about it much since then - hopefully somebody with more and more recent experience will pop in here. In fact, I can sketch something up to show how I would approach removing the noses and re-attaching them, that might make it more clear. I'll post it later tonight if all goes well. Yes, lovely sculpts! They are going to be a bit tricky to cast. It looks to me as if you could have a neat separation in the folds around the base of the nose, so you could cast them independently. Would be good to have something like a little square cavity in the face for really positive location. With the noses taken care of, you could certainly do your top head in a 2 part plaster mould, provided the silicone piece is soft enough, and your head armature does not create an undercut or crush the silicone as you pull it out. The moustaches could be done as part of the face, by doing a 3 part mould, with the section back from the rear of the moustaches being divided into two. But if your head armature is big, then you would be better off with a silicone mould. I prefer to use a firmer silicone for the mould than for the piece, as it has to hold its shape. So I tend to use Platsil Gel 25 or 10 for moulds and 00 for pieces. Take care to use release agent! The noses could be cast in a silicone mould, so you just have a seam underneath - you wouldn't want one running down the middle of the top of the nose. And they will need wires anyway for support. As for fixing - silicone sticks to silicone. I have used builder's silicone with success, although it is a bit firm. Oh, and one tip. You can pour melted Chavant into a silicone mould, ideal if you need to sculpt several versions of one head. 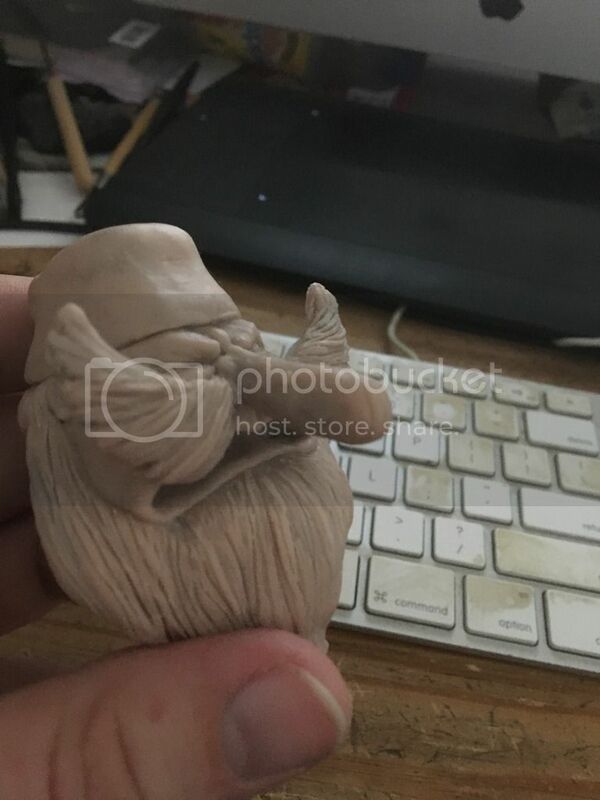 @Strider: I used Super Sculpy for my sculpt. Whether it is sulphur free or not is a mystery to me. As for the mustache on the second sculpt, I sort of knew that it could be a problem if I sculpted onto the head. For some reason I did it anyways... I think I got excited. That can be easily fixed though. @Simon: So lob off the noses and I should be good to go! It won't be as easy as cutting it off with a cutting tool, though. To keep the noses in the correct place, I made a 3D printed rig to hold everything in place while I sculpted. There's a solid piece of plastic underneath that sculpy. For the sake of progress, though, I'm willing to remake the sculpts in separate pieces. How many pieces do you think I should make, though? Should i just separate the nose from the face, or are there more pieces I should separate? Super Sculpey is sulphur free, you can make a silicone mould from it. Great character sculpts! I've made a front half of mould for a long nosed rat, but the nose was fairly tapering, and not as long as the first pic. Or bulging out so much like the second one's nose. Usually I would split the mould, like a left and right, or a top and bottom with the seam running along the nose, so I could get the clay (or Sculpey) out easily. That does create seam line in a very noticeable place that you need to clean up, though. A silicone mould of the face can be made as a single front piece, then you could cut it vertically through the centre of the chin and along the underside of the nose mould, so you could open it out to remove the clay. Leave the top of the nose uncut. A zig-zag cut means the halves fit together again, like having keys. A case mould over the outside of the silicone gives it a shape to fit into, so it closes up properly. That would probably still be good if it is just a mould of the nose. The idea of making the nose separately does make some sense. It looks like it would work, without a lot of blending needed when it is stuck on, with those designs. I made the beard and moustache for a silicone puppet separately, so I would have no issues with it getting stuck in. Making eyebrows as separate pieces also means they can be stuck onto wire loops that stick out from the forehead a little, so they can be animated waggling up and down more easily - or rotated to look angry or sad. I think if you are doing separate noses then it makes sense to do the big moustaches separately as well. Then the rest of the head becomes quite straightforward. Bit of a problem having to chop back the 3d printed armature for the noses. But that should give you the opportunity to make a plan how it will all fit together. Can you adapt the 3d print to include a spigot and socket for the separate pieces? That would make them locate really positively, and repeatability if you need to make extra heads. Well, I made my first mold recently. It seems to have worked fine, but it's hard to tell until I actually... You know... Mold something with it. Is there a way to melt clay enough to actually pour it into a mold? That way I can make a clay head prototype, and possibly make changes again if I need to make another mold. Some clays melt and pour well, some stay fairly thick and gluggy. Monster Clay is good for melting and pouring into a mould, and it is a non-sulphur containing clay so it won't inhibit the cure of platinum silicones. I usually melt it in my foam baking oven, which can be set to low temperatures like 50 degrees C or so. (Sorry, forgotten what the fahrenheit equivalents are.) But many domestic ovens are a bit too fierce. You can do it on the stove with a double boiler - a big pot with water in it, and a smaller container inside that with the clay in it. That stops you burning the clay. In order to avoid trapped air bubbles, I tend to fill deep parts of the mould (e.g. the nose) while it is open and to paint in areas like the ears that might be too thin for the clay to flow into. I still end up with a few cavities, presumably where the hot clay meets the already-cooled stuff, but at least I have got the shape right. Perhaps I should be bolder and just pour it in one go! Just been re-reading this thread. Do post some pics of your progress. The sculpts are so lovely, it will be good to see how you are getting on. I took your advice Nick, and bought myself some monster clay for the mold. I can't recommend Monster clay enough! It's a beautiful thing! Pouring the clay into the mold, however, was not a beautiful thing. I had some serious design flaws in my mold that I will no doubt be remedying in the future. 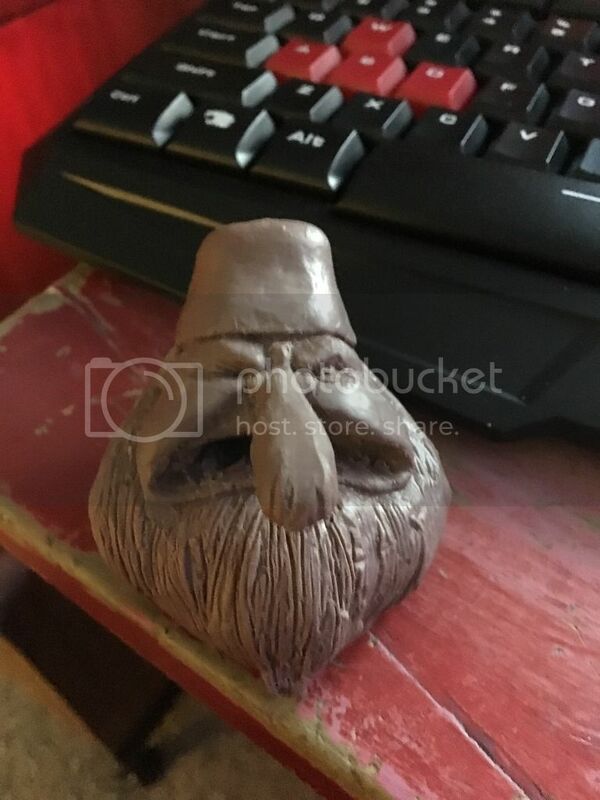 For one thing, I did not remove the nose nor the mustache from the sculpt and molded it the way it was. I rationalized that if I didn't do a front-and-back mold, and instead used a side to side mold, I could get the nose and mustache in without editing the sculpt. For another thing, I made the pour hole really really small and in a weird place. This little hole was a nightmare to use, and eventually I just plugged the sucker up and poured clay into the two open halves and then quickly tried to smash them together before they spilled all over everything. The results were terrible (surprise surprise). But after a few tries, I mastered my floundering, chaotic technique and made a head that I think is acceptable. Notice his lack of mustache. After leaving the mold, all that was there where his mustache should have been was a gaping hole on both sides. I think I'll leave them off and just stick them on later with interchangeable mouths. I still have some polishing up to do on this guy, so this isn't a finished piece yet. But I thought I'd let you all know how it went.